Capt Charles Plowman Murchie (681) served with the RFC and RAF from 1914 until 1926 and had been a company director before joining the RASC in January 1940. He was serving at the EFI (Expeditionary Force Institute, the militarised NAAFI placed under the command of the RASC) headquarters in Arras when the Germans invaded France in May 1940. The forty-seven-year-old administrative officer evaded capture and went into hiding in the woods around Frevent along with seven other RASC/EFI soldiers, including Sgt R E Knight* (986) Sgt T Boyle (246) and Dvr D S Boyd (518). It was here in July that Murchie first met 2/Lt Richard Parkinson (412) - later to play such a major role in helping escapers from St Hippolyte - who he advised to remain in hiding until the local Organisation contacted him. 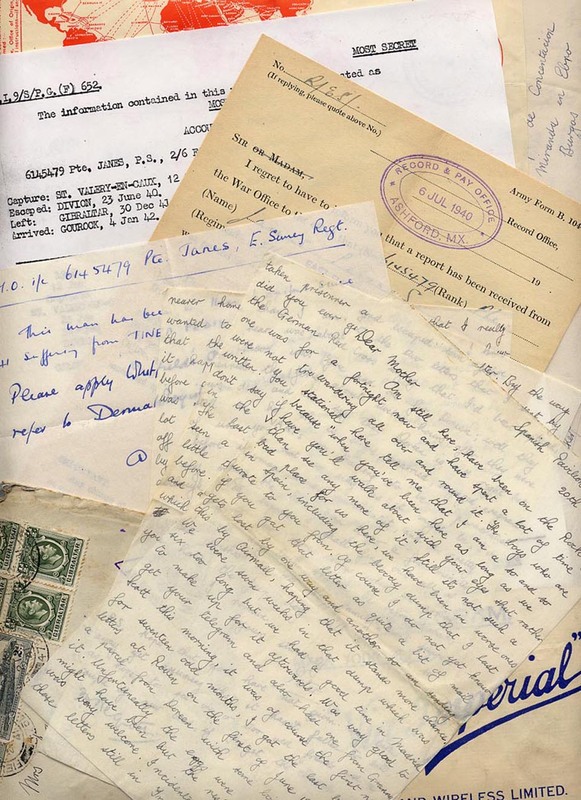 While Knight and Boyle set to work on a farm at nearby Conchy-sur-Canche, Murchie soon left for Lille to start raising funds to help support the many British soldiers he knew were hiding there - he also sent money back to his EFI men. Towards the end of September he met Harry Clayton. A/Sgt Henry Keith 'Harry' Clayton (701) was an interpreter for the RAF who lived in Lille. He had been captured in May at Abbeville whilst trying to return to his unit after leave in Paris, and subsequently escaped from a POW camp in Germany. Murchie had been searching out British soldiers and trying to arrange their escape to the unoccupied zone and Clayton immediately volunteered to help him. With his French wife Ninette and able to pass as French himself, Clayton could travel freely to raise funds and keep Murchie in touch with the many pro-British French groups in the area. In the second week of October a misunderstanding led to Clayton believing he had been betrayed to the Germans and so he and Murchie headed south themselves along with St Valery escaper Pte J T Clarke (655) of the Black Watch. After being helped out of the zone interdit by a railway worker in the Organisation they arrived in Paris 15 October. Two weeks later Murchie and Clayton were guided across the demarcation line near Castillon-la-Bataille to Lamothe-Montravel, east of Libourne on the Dordogne river, but arrested soon after arriving in the zone non-occupée. Posing as French, Clayton was released to continue his journey to Marseille alone whilst Murchie was sent there as a prisoner of the Vichy authorities. On arrival at Marseille, Clayton returned to the task of trying to get British servicemen out of the country but his civilian clothing and the fact that he lived by private means brought him under suspicion of being a spy by the other Britons at Fort St Jean. Finally Clayton moved into the Fort where he was soon reunited with Murchie who continued to work there with Clayton as his interpreter with the many new French contacts they made. Sgt Knight - one of the men with Murchie at Frevent - arrived at Fort St Jean in November and immediately offered to join them with their escape plans. On 20 January Murchie helped Sgt Knight to stow away on a boat to Oran along with Dvr E S Clayton (993) (RCS) who had been wounded and captured near Dunkirk then escaped at Lille and been brought to Marseille in an organised party with two other soldiers from La Madeleine. Sgt W A C Turner (1017) (RAOC) was a St Valery escaper who escaped a line of march near Doullens with L/Cpl J L Sweeney (228) (RAOC) and surrendered to French authorities after crossing the demarcation line at Chabris. Pte R J Ballard (1002) (5 Royal Sussex) had been captured near St Omer in May and escaped a line of march near Cambrai ten days later, been recaptured then escaped again from Lille before making his way to Lyon where the American Consulate arranged his transfer to Marseille. The four men were eventually repatriated to Gibraltar from the notorious Laghouat prison camp in Algeria in November 1942. There was another boat which left for north Africa in January 1941 on which Murchie arranged extra passengers. This one was was bound for Tunis, although some thought, or certainly hoped, the Sidi Bel Abbas was going to Casablanca, in which case it might call at Gibraltar which was of course where they really wanted to go. On board were Captain R N Brinkman (352) 2/Lt B R Fairclough (446) Colonel F A A Blake (590) and Merchant Navy Chief Engineer Kenneth John Logan. Roderick Brinkman was a Grenadier Guardsman who had been wounded and captured in Belgium and taken to the Casualty Clearing Station at Coutrai from where he escaped 8 November. He was helped by a Belgian intelligence organisation that first sheltered him in Brussels then gave him information to take back to England. He was guided to Marseille in early January where he promptly met Murchie and Colonel Blake. Lt Colonel Blake was the Military Attache in Brussels and had already changed into civilian clothes when the Germans arrived at Port Mahon in May. In this disguise it was a simple matter (sic) for the fifty-one year old to be released as just another elderly civilian and with two young French friends he made his way to the Lestocard farm at Baralle where he was sheltered until December. He was smuggled out of the zone interdite in a lorry and taken to Paris by train, finally reaching Marseille on Christmas Day. He met up with Murchie and Clayton at the Bar Henri opposite his hotel in early January and was soon introduced to Kenneth Logan of Inverness, his new travelling companion. 2/Lt Brereton Robert Fairclough and his South Lancs unit had been "forced to retire" from the Forges-les-Eaux area in June but he managed to lead at least some of his men south across the demarcation line in late August to Loches, where they were promptly arrested. He was sent to Chateauroux, where he first met Logan, and then Agde where he met Capt Leslie Wilkins (354). They were transferred to Fort St Jean in October and met Murchie who then provided the 30,000 franc charge for Fairclough's trip. Wilkins stayed on working with Murchie until his own departure across the Pyrenees in late February. NB. It is likely that these boat trips was actually organised by Varian Fry's friend Jean Gemahling through his underground contacts, with Murchie being the contact man for British servicemen and using funds supplied by Fry. On 7 January 1941 the inmates of Fort St Jean were transferred to a new internment camp in the military school at St Hippolyte du Fort, some thirty miles west of Nimes, although many absconded and stayed in Marseille, some in accomodation arranged by Murchie. Clayton went with them but only stayed one day, collecting information on the new camp before returning to Marseille and moving into the same hotel as Murchie, again posing as a Frenchman and now using the name Robert Delvalle. with a revolver" and sent south the following month to cross the mountains in three separate parties. The fact that Murchie told Parkes to contact JOSEPH, concierge at the Hotel Paris in Figueras, who then arranged for them to meet Mr Whitfield, the British Vice-Consul who got them train tickets for Barcelona, suggests that Murchie had established vital links across the Spanish frontier. In the third week of February Murchie organised a Spanish guide to take a party of ten men from Marseille across the Pyrenees from Laroque-des-Alberes. The party was led by L/Sgt J K Bell (308) and comprised Pte A F D Harper (302) Gnr F Castle (310) L/Cpl A Gardner (312) Dvr C F Watkins (316) Gnr E F Smeed (317) Cpl B Bell (412) Sgt H W Bratley RAF (351) Sgt G H Easton RAF (445) & 3/Eng Logan. The party took a train to Perpignan then two taxis delivered them to Laroque-des-Alberes where a second guide met them and led them up into the mountains. They spent the whole of the next day and night in the mountains before descending to La Junquera, a few miles south of Le Perthus on the main road to Barcelona the following afternoon. After a short rest they walked on, avoiding Figueras, to Vilamalla where they caught the train to Barcelona and the British Consulate. A letter was then sent from the Consulate to Murchie reporting on their safe arrival. Bratley was taken ill and Easton had sprained his ankle so they stayed on at a hospital arranged by the Consul whilst the others went on to Madrid. Six of the eight men were arrested on the train and spent the next two months in prison before being repatriated from Miranda del Ebro. Perhaps encouraged by the success of Bell's party in getting through to Spain, the most celebrated escape for which Murchie can claim credit was that of 2/Lt Richard Broad (284) and his party of 12 soldiers, including six of the seven Seaforth 'dwarfs' he had brought south from St Valery. Within a month of their arrival in mid-February they were taken from St Hippolyte in two lorries arranged by Murchie (one driven by Harry Clayton) and delivered to Nimes station where they met their Andorran guides. The party went on to Perpignan by train - where they were supposed to meet with Garrow next morning but Broad overslept and missed him - and taken across the Pyrenees to Figueras where they caught an early morning train to Barcelona. NB. William Moore's 1986 book 'The Long Way Round' states that "the ever helpful Sergeant Clayton" was actually Harold 'Paul' Cole - but this is incorrect. After Murchie had been arrested three days in a row, he finally took the hint and left Marseille with Harry Clayton on 15 April 1941 at which point (according to Varian Fry at least) he appointed Ian Garrow as his successor. Murchie and Clayton crossed the Pyrenees with a mixed group of civilians (including future Bourgogne radio operator, Andre Minne) from Perpignan to Figueras where they were arrested and the two men charged with espionage - the only example I can find of this ever happening to British servicemen. They were held at the military prison of Castillo Montjuich in Barcelona for more than six months before the more usual series of Spanish concentration camps ending with Miranda del Ebro from where they were finally released for repatriation in February 1942. Murchie claims in his MI9 debrief to have helped some 150 officers and men in escaping from Marseille to Spain and North Africa whilst Clayton estimated the number at 100 servicemen with another 70 helped indirectly during their five and a half months in Marseille, and the evidence now available would seem to support these numbers, in addition to the many men they also helped bring down from the north. Unfortunately history generally fails to recognise Murchie and Clayton's early contribution to the Pat O'Leary Line. This is probably because, by the time he came to write his book, James Langley had got to know Ian Garrow (not mentioned at all in Langley's March 1941 E&E report 213) so much better, especially after 1943 when he joined Langley at MI9. Neave also ignores Murchie in favour of Garrow, and later of course the much celebrated Belgian officer who arrived in Marseille in July 1941 and ran the line which came to bear his name after Garrow's arrest in October. Garrow had been of particular interest to MI9 from at least early 1941 and was the only British officer officially recognised by MI9 as ever heading the escape organisation. Their credibility probably wasn't helped by Capt Derek Lang (174) stating in his extensive debrief that he considered Clayton suspicious and should be checked up upon - this from a man who spent a month in Marseille from mid-October 1940 and despite meeting Caskie, who he said "was not actively engaged in escape plans", failed to find any British organisation for escapers. Lang left Marseille on 16 November on board the Mairette Pacha, bound for Beirut, his 8,000 franc ticket paid by one of his French helpers. Airey Neave's "Saturday at MI9" doesn't mention Murchie or Clayton whilst Foot & Langley's "MI9 Escape and Evasion" only includes a "Sgt Clayton" for daring to return to his home in Lille after escaping a German POW camp - information that must have come from the same MI9 report that details his subsequent escape line work but which is completely ignored. Langley certainly knew both Murchie and Clayton in Marseille, and probably earlier when he was sheltered after escaping from hospital in Lille. There was also report on a Czech journalist named Frank Weiner (or Winer), written when he was interviewed at Gibraltar in October 1941 in which he describes Murchie as an incapable drunk. Weiner had been hanging around Marseille for some time trying to get involved with Garrow, who he believed worked for SIS. The contact was probably encouraged by his mistress Stella Lonsdale - herself a suspected German agent who spent most of the war in Holloway after she reached England in late 1941. James Langley, who had known Weiner in Marseille, said in a report dated 19 November 1941, that Weiner was a well known figure in various bars and night-clubs. Langley described him as one of the most gifted liars he had ever met and said he was indiscreet in every language he knew - which were many. What Harry Clayton wouldn't have known until he reached Gibraltar was that his wife - listed on the uboat.net website as Berthe Jeanne Clayton (née Savaart) - having made her way to Spain and Gibraltar, was lost when the British passenger ship Avoceta was torpedoed and sunk north of the Azores on 26 September 1941.